Are Dryer Sheets Harmful to Your Family? What Alternatives Do You Have? I know a lot of people who just can’t do laundry without throwing in a dryer sheet. I’ve never had that habit, and when I tried the ones we were given back when we were first married, really couldn’t see what the benefit was. But a lot of people do love them, and use them without considering the potential harm the simple dryer sheet may do to their family. A big part of this is air quality issues. There’s an article on the National Institutes of Health website that gets into the risks of using scented products indoors, and dryer sheets are one of the topics covered. They give off a variety of VOCs, and there have been cases of children having a seizure after being exposed to dryer sheets. It’s not going to happen to every child, of course, but that’s still pretty serious. Simply put, there are better ways to help your laundry smell fresh, ways that don’t involve the waste and harsh chemicals of dryer sheets, even the unscented ones. Hanging your laundry out to dry is one of the best ways to handle the issue. You get that fresh air scent naturally, rather than the imitation some dryer sheets try to give. 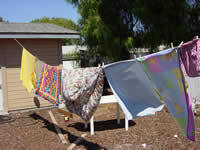 Not only does line drying mean you don’t need dryer sheets, it saves all the energy using your dryer would have taken. You can still take down slightly damp laundry and give a few minutes in the dryer for those things that tend to come out crunchy when line dried, such as towels and jeans. The crunchiness may not last long once you start using them, so you may choose to skip even that much use of the dryer if you can stand it initially. You can add a half cup of white vinegar to your wash during the last rinse cycle as a natural softener. This can even help your laundry come out softer when you line dry it. Vinegar in the last rinse cycle helps to remove the last of the detergent from your laundry. If you truly love the scent given to your laundry by dryer sheets, why not make your own? Pick a favorite essential oil , place a couple drops of it onto a damp washcloth and include in the dryer with the rest of the load. It will scent your laundry nicely. Another tip for those who use their dryer for their laundry is to add in a ball of aluminum foil. Roll some into a tight, 2-3 inch diameter ball and throw it in the dryer with every load. It will take care of any problems you have with static in your laundry, and should last a long time. A tennis ball may help as well, but they may contain toxic chemicals. If you prefer the dryer balls you’ve seen advertised elsewhere, go for ones that are PVC free and aren’t packaged in a bunch of plastic. Just be aware that some people feel that some types create holes in their clothes over time. If you just can’t give up the dryer sheet habit, at least go for some of the more environmentally friendly options. Mrs. Meyers is a good choice, but Method may be easier to find locally. You can also buy reusable dryer sheets such as Static Eliminator . They should be good for hundreds of uses, which beats buying boxes of dryer sheets. On the other hand, I don’t know that they’re any better than any of the solutions you can do right at home. As you can see, there are plenty of simple ways to quit using dryer sheets without having to deal with static cling or laundry that doesn’t smell right to you. Make this simple change and you’ve cut one source of VOCs from your home. Many popular beauty treatments you buy in the store really aren’t that good either for your skin or the environment. They give a temporarily good look, but in the long run they’re hard on your skin and may even be damaging. It’s amazing how easy it is to make some basic beauty treatments at home with products that are much kinder to your skin and the environment. They won’t feel exactly like store bought products going on, but that’s not a bad thing at all. Do your best to find organic versions of these products. Fair Trade is a good choice also when you cannot find locally produced versions of these products. Coconut oil , especially organic, virgin, unrefined coconut oil is wonderful for your skin. You don’t need a lot. Just take a little and rub it in. It’s also very good for hair, but be very careful to not overdo, or your hair will appear oily. Jojoba oil has similar effects to coconut oil, but it is a much lighter feel. It is considered to be the most similar to the skin’s natural oils. Shea butter is another great choice for dry skin. Once again, organic and unrefined are the best choices, and you may be able to find Fair Trade shea butter. There are claims that shea butter can treat a variety of skin ailments, but I would suggest testing it out on your own. Honey is an ingredient in many homemade facial recipes. The simple reason is that it’s great for most types of skin. It’s mildly antimicrobial and helps to keep skin moisturized. It can even be used to soothe cuts and burns. Raw honey is considered to be better by many people. The proteins in egg whites are good for your skin. Whip them, apply to your face, and let it dry for 15 minutes before rinsing off with cool water. Many people are fans of the wide range of uses of apple cider vinegar . On your skin it acts as a natural toner and is great for the pH balance of your skin. Some essential oils are great for your skin. Others aren’t so research before you add any essential oil to your skin care regimen. They should always be added to a carrier oil such as coconut oil or jojoba oil, just a few drops per ounce. Lavender is a great choice for a relaxing scent. Tea tree oil is popular for its antiseptic effects. There are many more products you can find around your home to care for your skin. The best part is that you can treat your skin wonderfully while spending less than you would for name brand products that might be damaging your skin in the long run. Published by Stephanie, in Eco Friendly Beauty Tips.